HLF15-11/12 : 2015 - Set 2 Maxi FDC USA "Stopover 9 Philadelphia & Camden - HERMIONE"
+ Red cachet "POSTED AT SEA"
HLF15-PT1/5 : 2015 - Set 5 Marianne "The Hermione on the trail of Lafayette"
HLF15-19 : 2015 - Maxi FDC FRANCE-SPM "Stopover No. 16 in Saint-Pierre / HERMIONE"
HLF15-3 : 2015 - Maxi FDC SPAIN "Stopover No.1 Canary Islands - HERMIONE / LAFAYETTE"
HLF15-4T1 : 2015 - FDC BERMUDA "Stopover No. 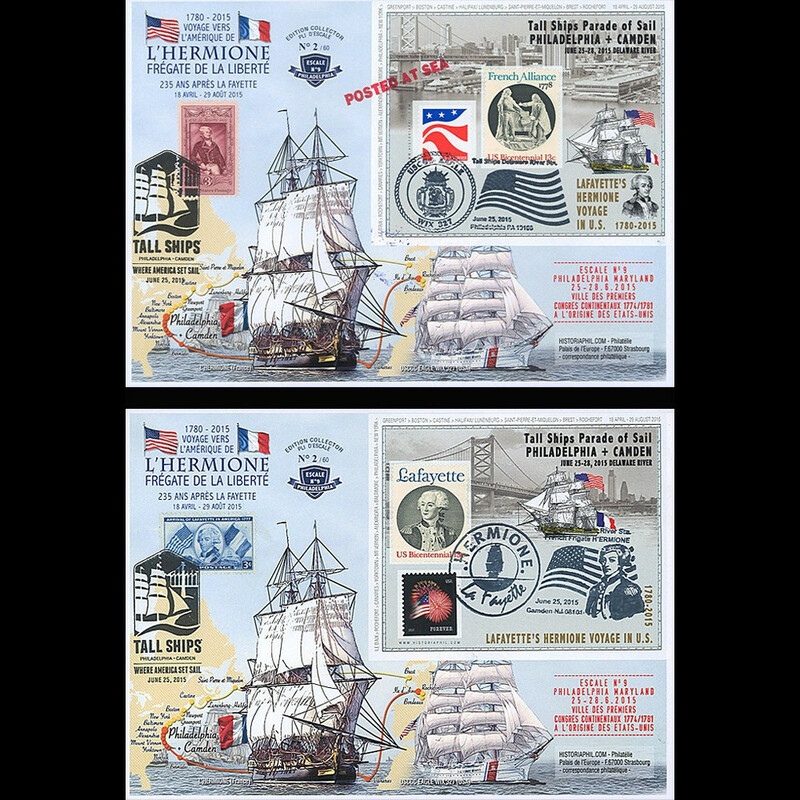 2 in Saint-Georges - Frigate HERMIONE"
HLF15-5 : 2015 - Maxi FDC USA "Stopover No. 3 in Norfolk - HERMIONE / LAFAYETTE"
HLF15-6 : 2015 - Maxi FDC FRANCE-USA "Stopover 4 in Yorktown - HERMIONE / LAFAYETTE"
HLF15-7 : 2015 - Maxi FDC FRANCE-USA "Stopover No. 5 in Mount Vernon - HERMIONE"
HLF15-8 : 2015 - Maxi FDC FRANCE-USA "Stopover No. 6 in Alexandria - HERMIONE"
HLF15-9 : 2015 - Maxi FDC FRANCE-USA "Stopover 7 Annapolis - HERMIONE / LAFAYETTE"
HLF15-10 : 2015 - Maxi FDC FRANCE-USA "Stopover 8 Baltimore - HERMIONE / LAFAYETTE"
HLF15-13 : 2015 - Maxi FDC FRANCE-USA "Stopover 10 New York - HERMIONE / LAFAYETTE"